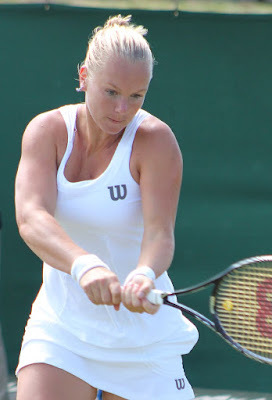 Unless you are a real tennis nut you might not know who Kiki Bertens is but the 27 year old Dutch pro tennis player is one of the prettiest women in tennis in 2019. To show that, here are some hot photos of Kiki Bertens in 2019. All photos below expect second one by Steve Pisano. Second photo by si.robi. Kiki Bertens was born on December 10, 1991, in Wateringen, Netherlands. So far in her tennis career, Kiki Bertnes has won 8 WTA women's singles titles and 10 WTA doubles titles. Kiki's career earnings are over $7 million. Women tennis players can earn pretty good money in 2019. At the Grand Slam tennis events, Kiki Bertens' had her best showing this year at the 2016 French Open where she made the semifinals. Beautiful Kiki Bertens also just reached the quarterfinals at the French Open in doubles play which tied her best showing to date.